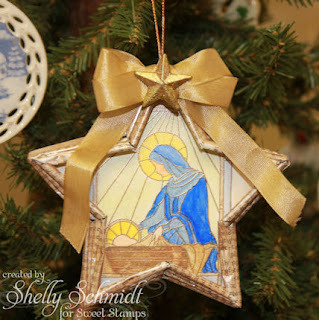 This week at the Sweet Stamps Challenge we are making Ornaments- we want to see ornaments or an ornament on your project. 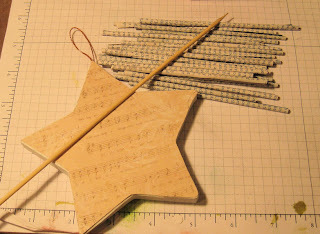 I found this idea for the rolled paper star on Pintrest- but did not 'pin' it, so I cannot give you the link (if I find it, I will.......). I had a paper mache star ornament, I painted it white then added Bo Bunny DSP with Gel Medium. I decided Beige CI paint would work the best for the look I wanted. I added the rolled paper around the edges and used gel medium to attach them. * Kendra * Linda * Nazeema Calypso"
Bloggers Challenge this week is Christmas in July- Yeah- I have a card made to play along! This is a card I made with some of the Poinsettia's created for last Tuesday's challenge at Sweet Stamps- colors and supplies listed in THIS post. 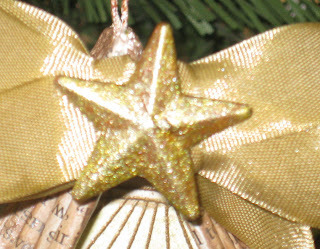 I won this gorgeous ribbon- I added some metal rhinestones to the ribbon after tying a bow. 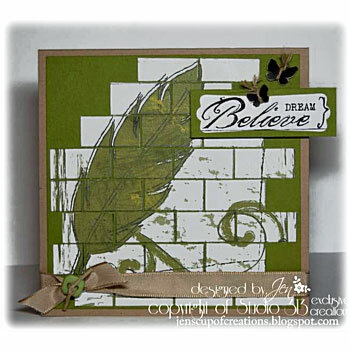 The background is from the Technique Junkies and is called Acrylic Block Taping. 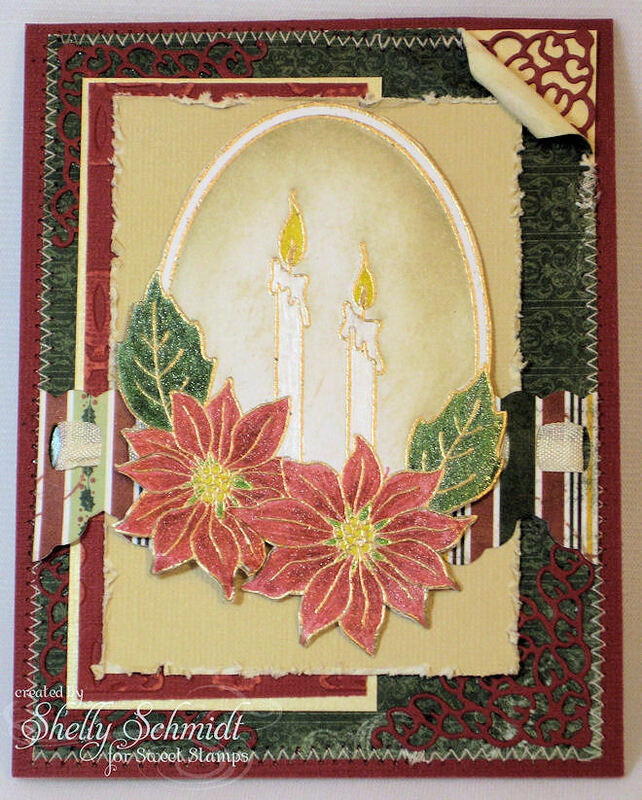 The poinsettia's were added in another technique called Cascading Image from the Technique Junkies. 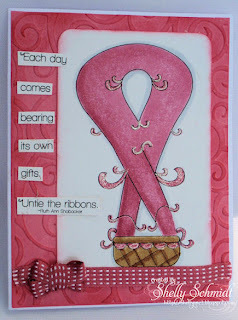 Bloggers Challenge 'MOM' Lisa can be found HERE. We play weekly- when we can- and it is just for fun. 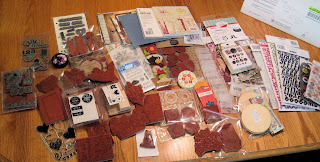 I have been wanting to join in the Impression Obsession challenges for a while now, and my friend Lynn got me going - we both did the blog hop last week......... every day.... what great inspiration! 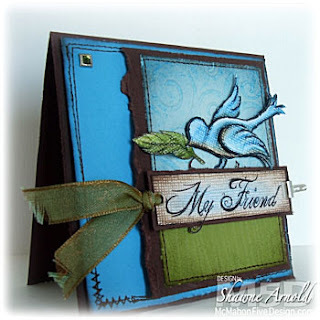 I love this gorgeous stamp and thought it would be perfect for the challenge this week- that ends tomorrow- Fly Away. 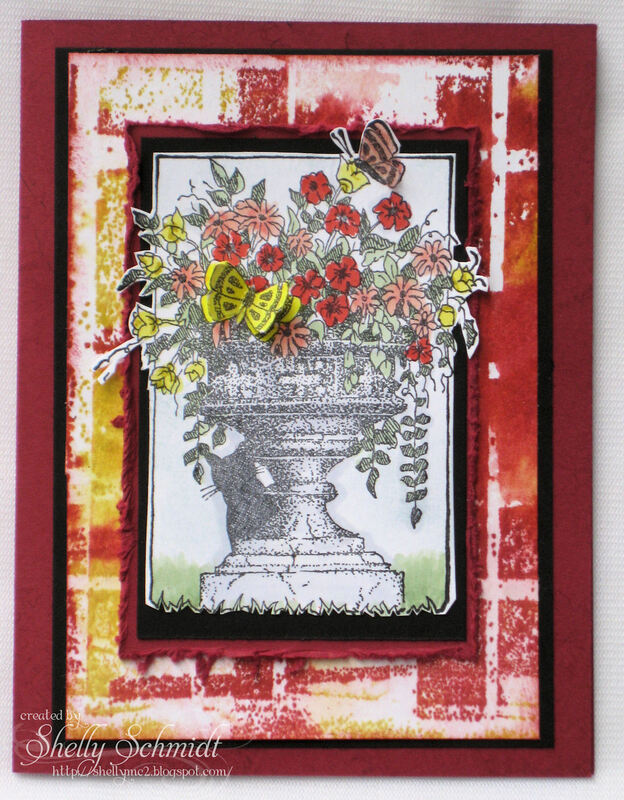 This image is called Garden Planter- I stamped it with Black Memento Tuxedo ink, and colored it with Copics. I wanted to use this background I made using new SU colors and a Technique Junkies technique called Acrylic Block Taping. Don't you love the little black cat peeking around the bottom of the planter? 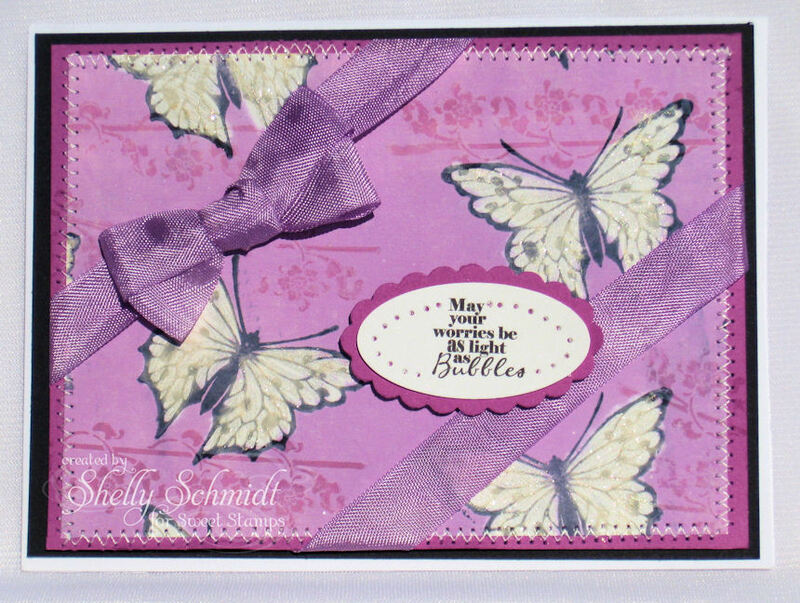 I made the two butterflies dimensional and added Sakura Jelly Roll pen to them to add shimmer. 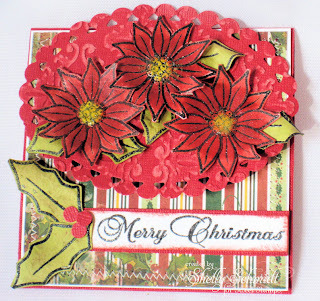 This week at the Sweet Stamps Challenge we are making Christmas Flap Cards. 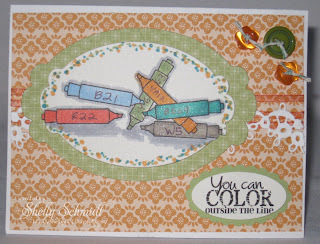 The tutorial for Flap cards is HERE in the resources section of Splitcoaststampers. 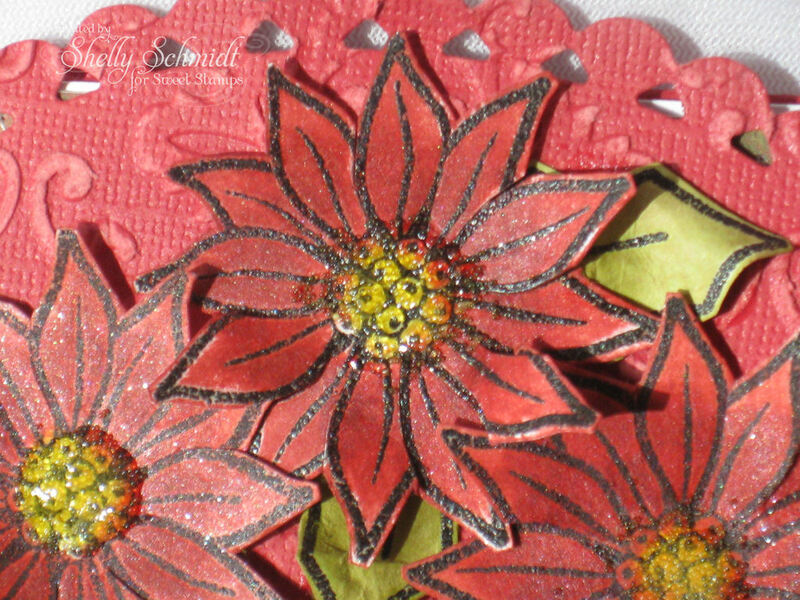 I added just a 'smidge' of Creative Inspirations Fairy Dist paint and water to the distress ink when painting the flowers. 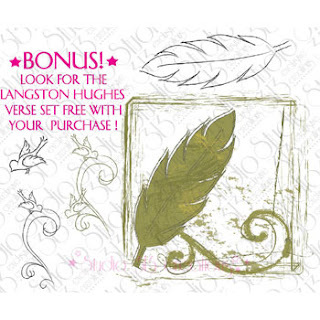 and use the code JULY25 at the checkout. I saw this great sentiment and it seemed to work beautifully with this card. 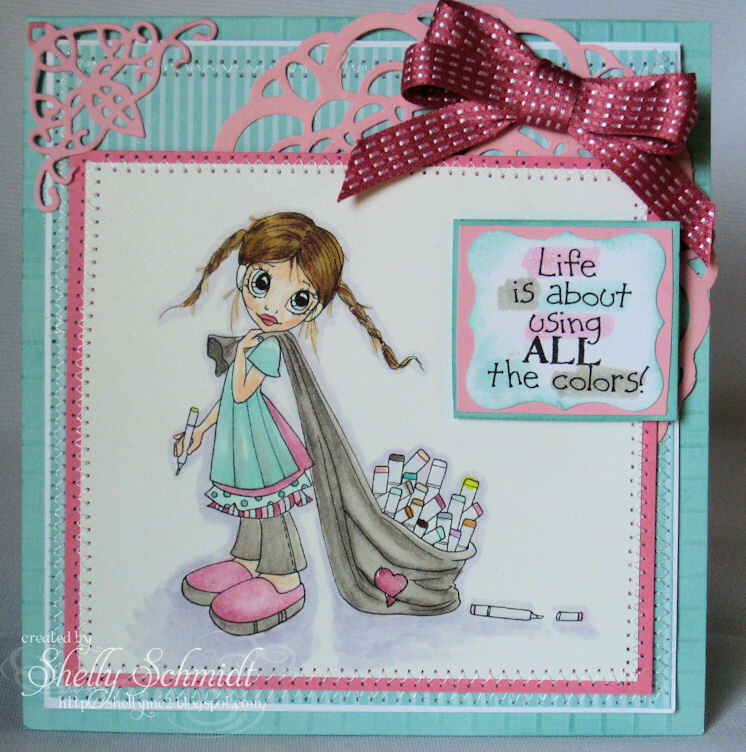 Remember a few weeks ago when Sweet Stamps had the bleach challenge? This was my first attempt at the bleaching- and when I tried to bleach the purple ink , it turned turquoise..... Well, the blue faded away and so I finished up the card. 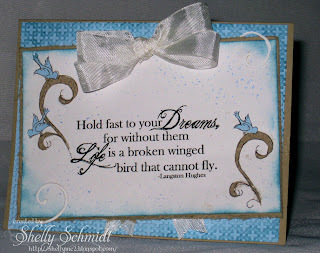 I painted over the bleached out butterflies with Creative Inspirations Fairy Dust paint. 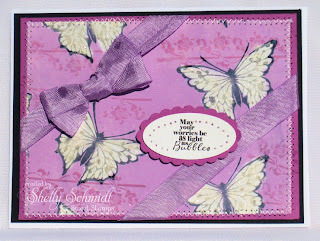 The butterfly and background images are from Sweet Stamps and the sentiment is from Create with TLC. I added a seam binding bow using a Copic marker to color it purple. 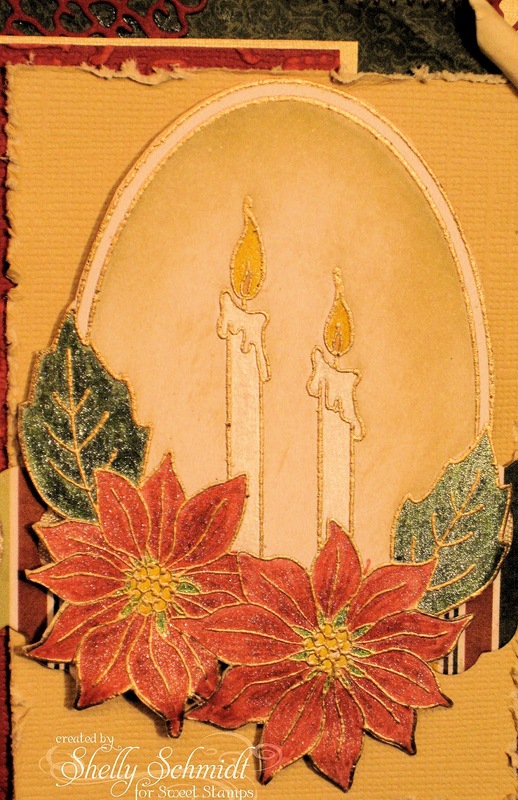 I hope you have a wonderful worry free or worry light day! 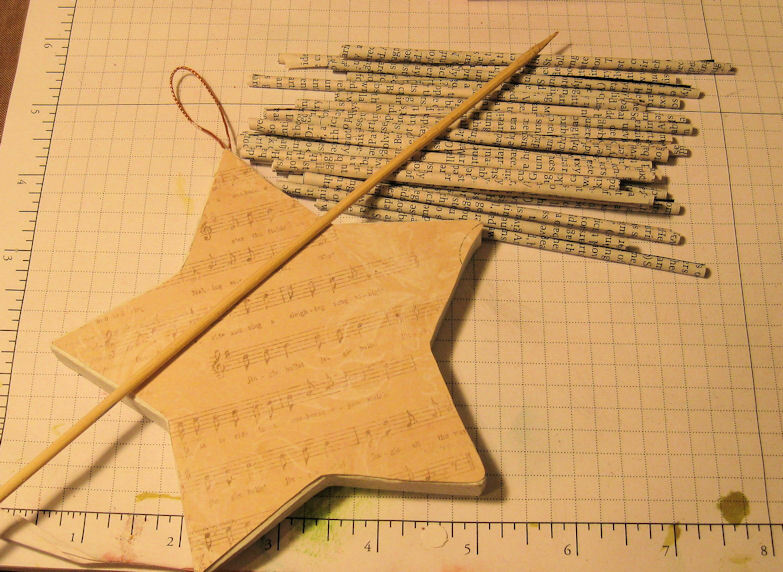 This week at the Sweet Stamps Challenge we are making Christmas Parchment Cards. I used the Beautiful Poinsettia Candles image again this week. 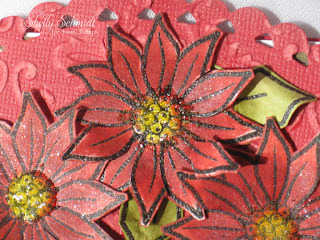 I colored the Poinsettias/leaves with Spica Glitter pens- Oh how glimmery- love the Spica pens!!! 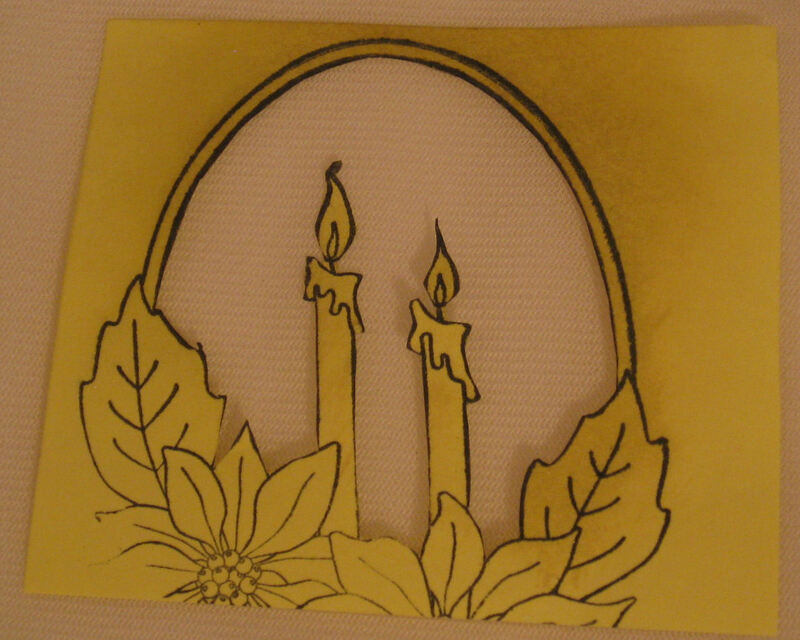 The best part- you can use digital images too. 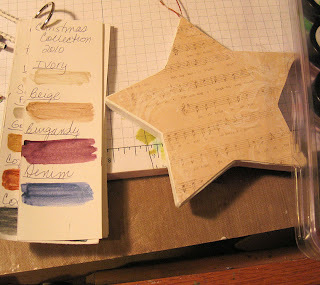 I used SU Cameo Coral cardstock and a R22 Copic to color my seam binding to match. 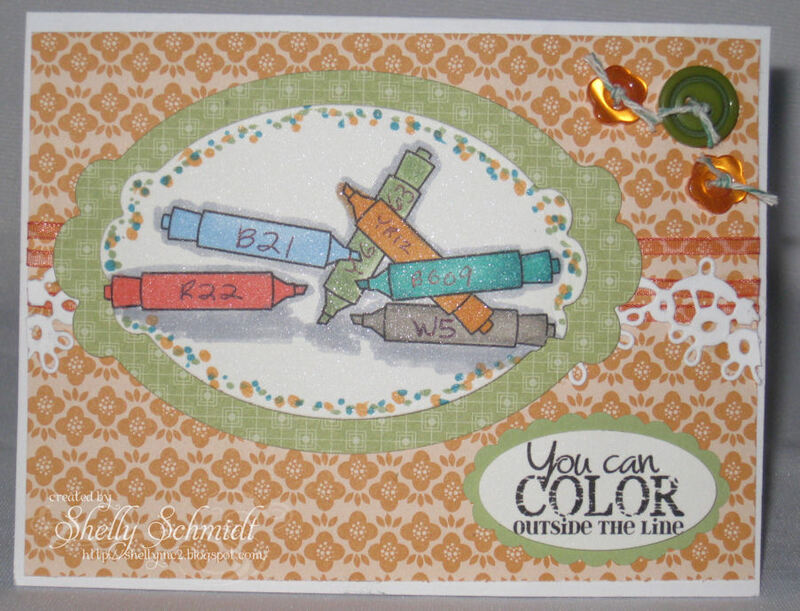 The berries are colored with R22 and R24 and I added Crystal Effects over that. 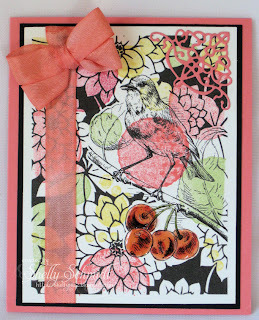 The B165 corner die is by Cheery Lynn Designs. 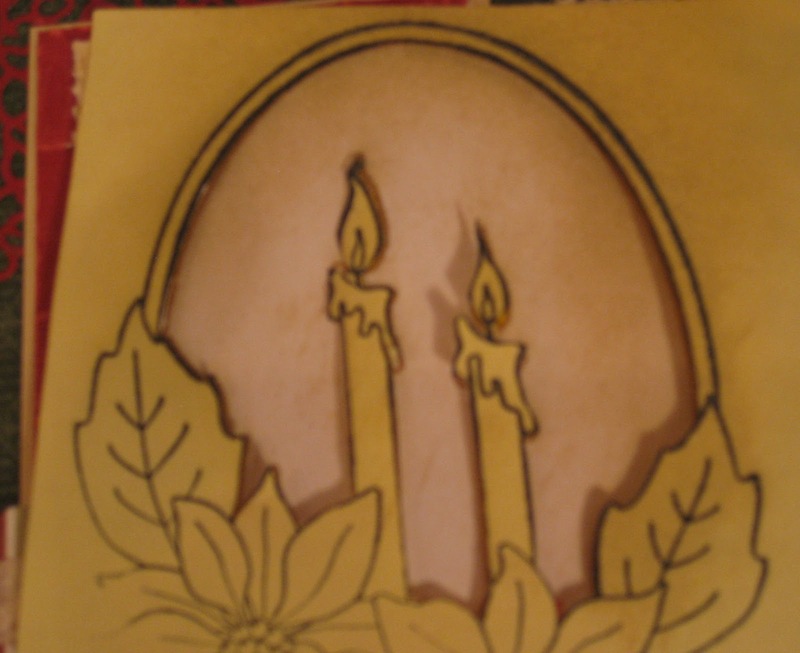 The Image is a digital image from Create with TLC. 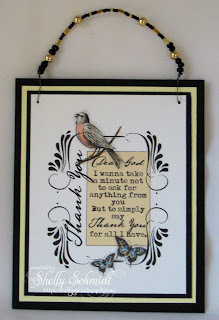 If you use digital images and have not been to Create with TLC, stop over there and get on her blog list- Paulette is very generous and has the greatest sentiments around! And, one more member till she celebrates for 1900 followers! Oldie but Goodie- used circle stamps that have not been used in a few years! My husband tells me I should go buy a lottery ticket.......maybe I will! First, I entered Holly's Blog Candy for a lace Copic wallet I found her link on Saturated Canary's blog. 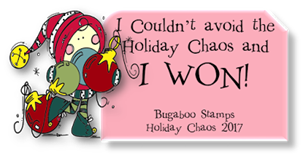 I also won a Blog candy at Link Up for Pink recently. Sponsored by 3 Girl Jam and Bugaboo (digi's). 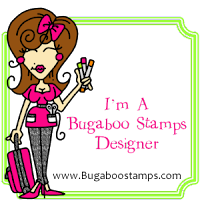 Stop by Link Up for Pink 7/21 for a Blog Hop! 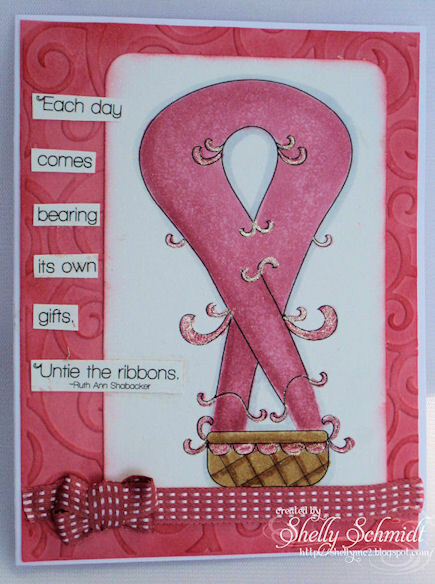 Don't we all know someone affected by Breast Cancer- or any other cancer??? My Nephew went through chemo and radiation last year (he is 5) for a Wilms tumor). He -and the family- really enjoyed and appreciated all of the cards and words of encouragement they received. This week at the Sweet Stamps Challenge we are making Vintage Christmas Cards. 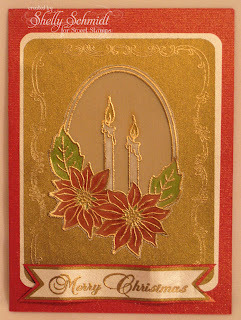 This card was so hard to photograph! 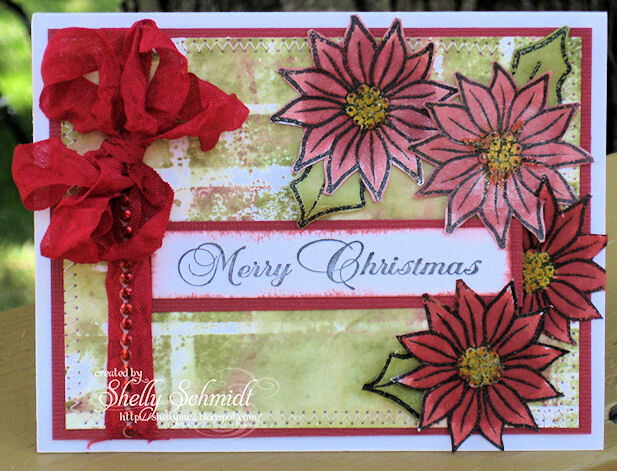 I colored the Poinsettias/leaves with Spica Glitter pens- Oh how glimmery- love the Spica pens!!! 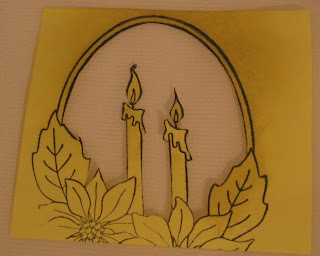 Add on the distress ink. 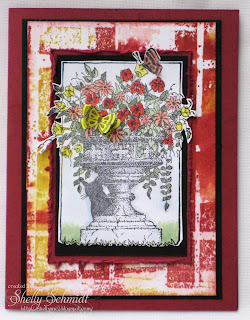 My SCS Stamp Addicts Blogging group (waving) has a Masking challenge for the month- how fun is that! 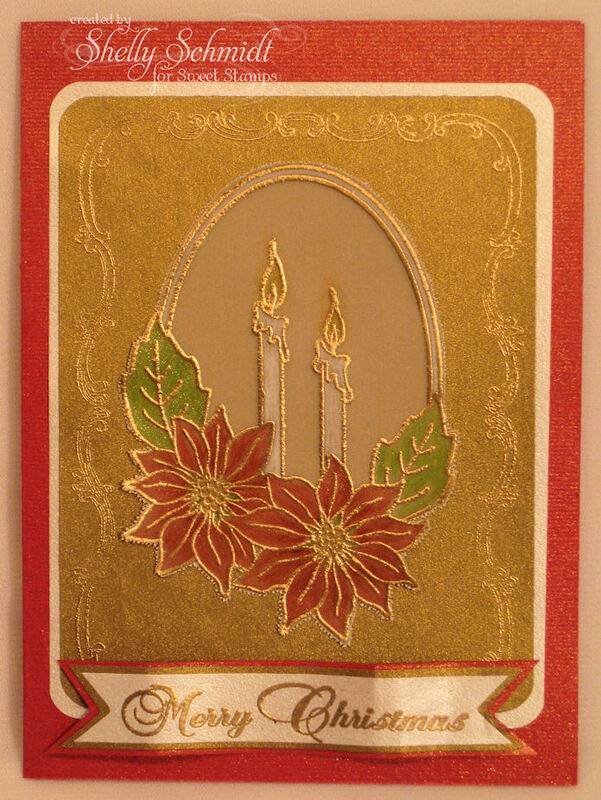 I used Technique Junkies Sanded Coordinations and Curled corners for this card. 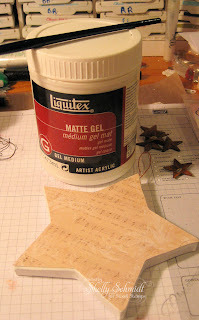 Card Making Mama's- Use Rubber! Each month there is a new BCA freebie at McMahon Five Designs- I am just loving this one- how fun! I colored in the image with R81, R83, R85. The basket is E31, E33, E35 and I outlined the image with C3. 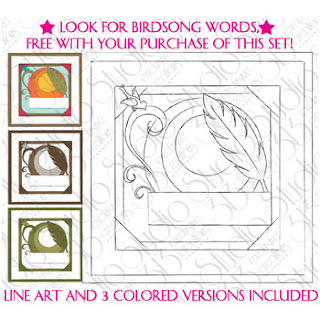 I texturized the image with Copic Blending solution. I added Sakura Gelly Roll Pen to add shimmer. 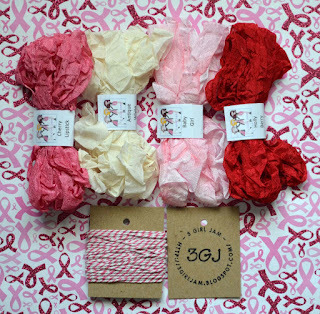 The ribbon is SU. This week at the Sweet Stamps Challenge we are using a 'Resist' technique. 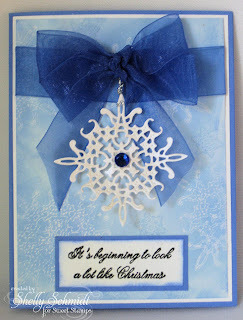 I used wax paper between the snowflake die and the paper cut out, and used it as my wax paper resist. 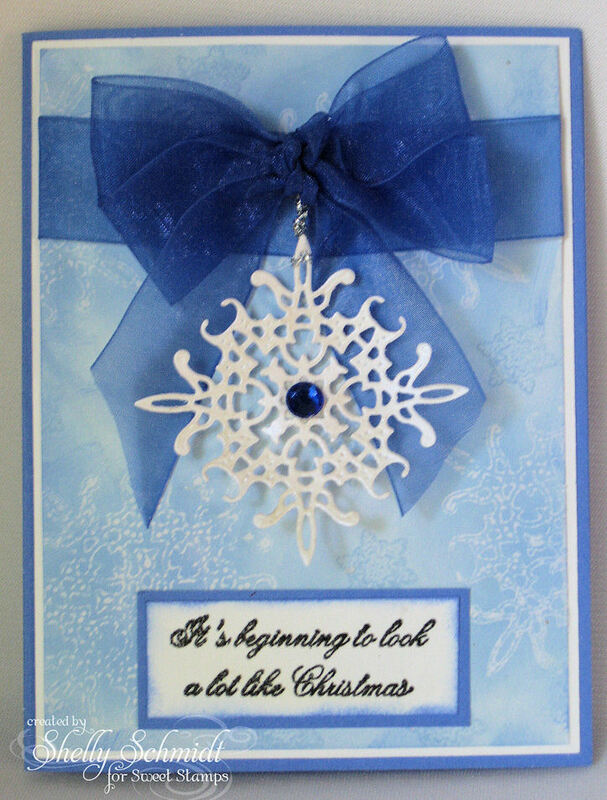 I stamped the smaller snowflake in blue to accent the resist snowflake. I painted Creative Inspiration Paint Blue Ice on the snowflake so it is sparkly and added it with a dimensional to the card- and added a blue gem to the center of it. 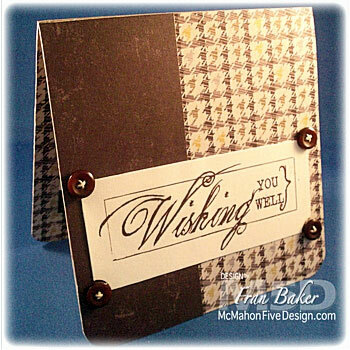 McMahon Five Designs has gone to Monthly Releases for the Summer- it has been a nice break, but I really enjoyed creating this week! 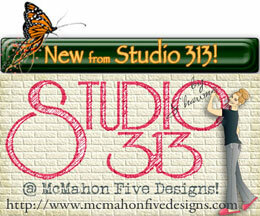 Studio 313 has released a number of new files today- all are visible on my previous post. I had to learn to merge digital images. 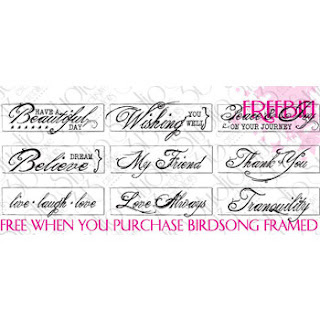 I was able to move the flourishes and birds and the sentiment closer together, but still need to learn to 'merge' images to make a scene. 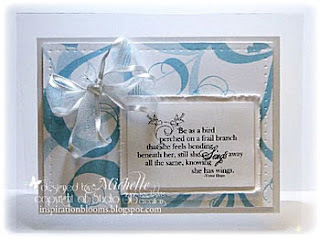 The birds are layered up on the flourishes already- I printed the images out on Cryogen White and Kraft cardstock. 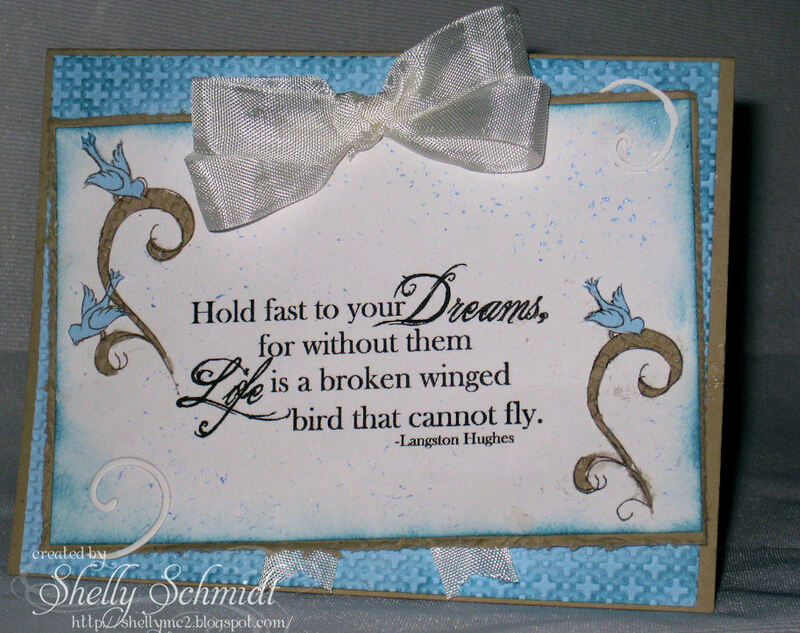 I printed more of the images out on blue cardstock and fussy cut the birds and 'layered them up' . 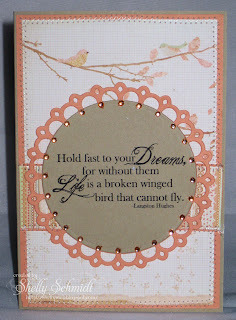 I sponged some SU Marina Mist on the edges and on the background embossing. 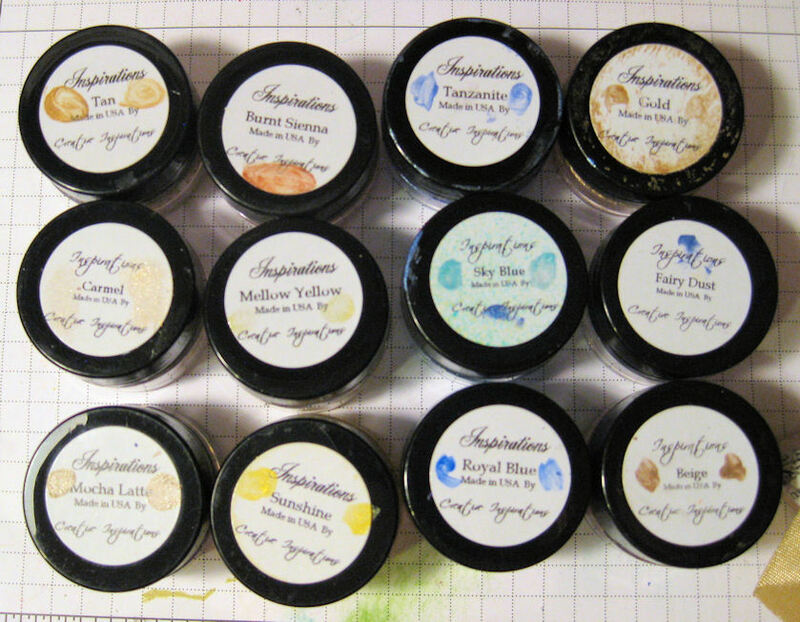 I also added some small splatters of Creative Inspirations Sapphire paint - love the special shimmery touch that adds! Next, I used some Prima Songbird DSP and left the card CAS....really- I am giving it a try! 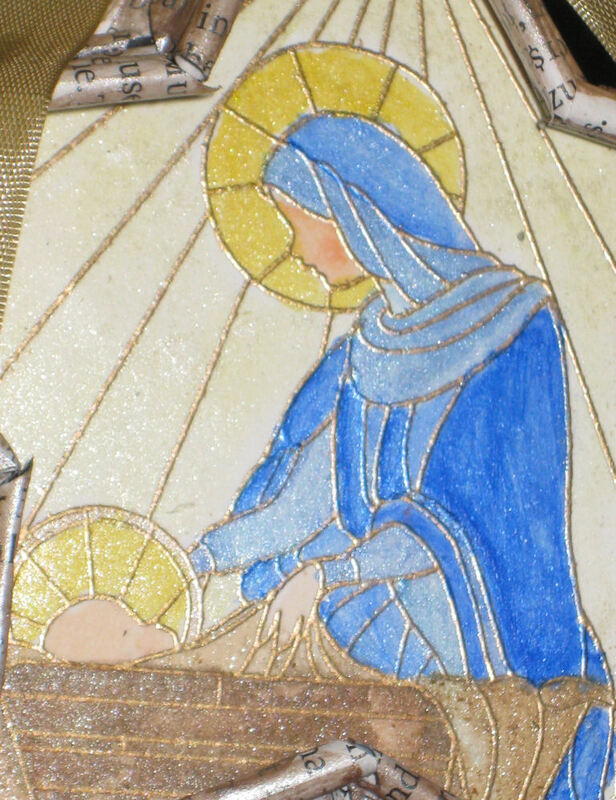 I used R02 to add color to the jewels and added them to the sentiment panel. 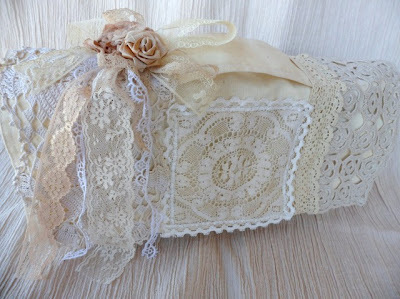 I added a line of stitching to the outside and decided to stop....... 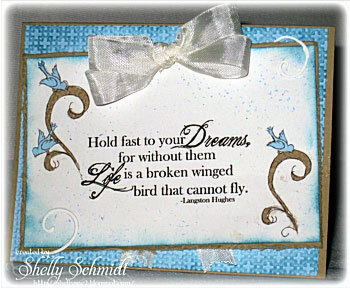 I think this sentiment will be awesome for Graduation cards- I am going to stamp a sentiment about 'soaring' on the inside. 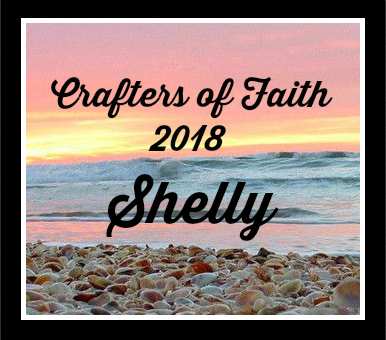 There is a SALE right now on selected items in the store-be sure to sign up for the newsletter HERE to keep up with the latest releases and specials in the store. 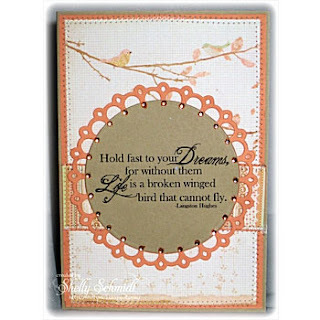 All of today's images coordinate with digital papers already available! 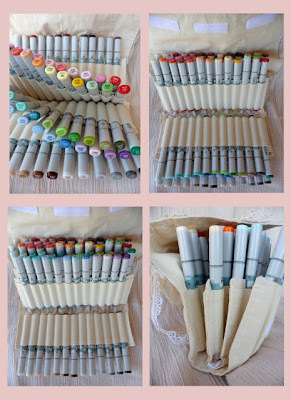 68 File Set in 3 colors! I made a hanging today to hang over my work desk. 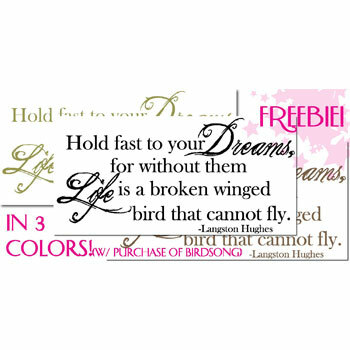 I am feeling very Blessed in my life! The image is from Create with TLC- I lightly added color to the bird and butterflies. 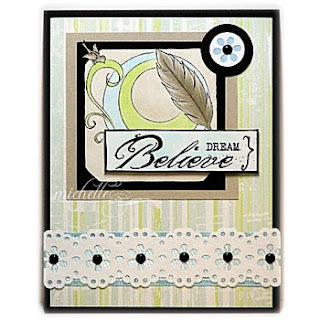 Cardstock is by Paper Temptress- the off white is textured and the black is sparkly! I colored 24# wire with a Black Sharpie and added the beads. Life is about using ALL the Colors! 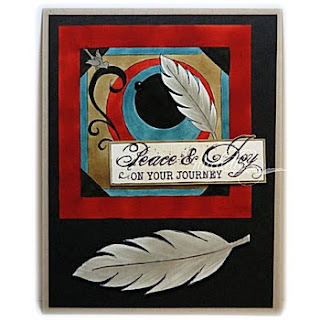 I noticed today that residents of the USA are not eligible for any prizes- which is OK- I just loved the image and will be sending this card to an artist who has a birthday coming up at the end of the week ( my Mother!). She will love this! 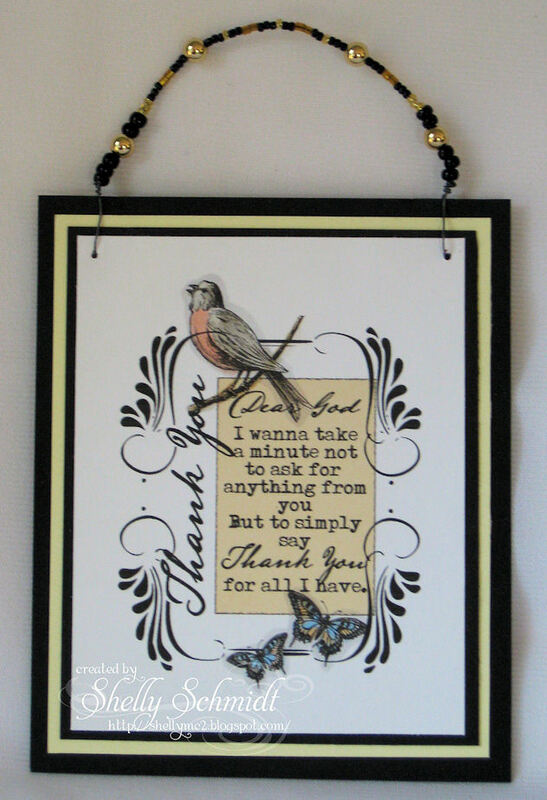 The image is by Saturated Canary, and the Sentiment is by Create with TLC. 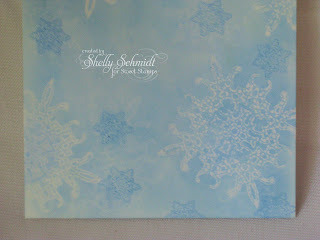 I added the Copic colors to the markers- they are colored on Cryogen White cardstock- can you see the sparkle? 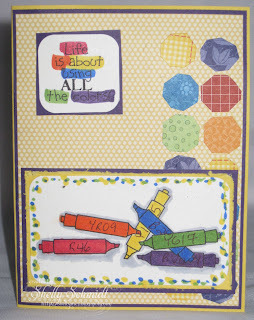 I love this sentiment and used primary colored this time. 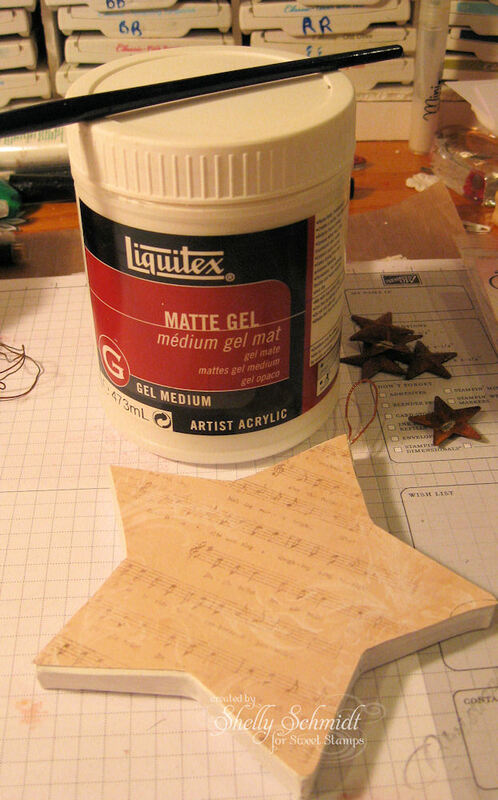 I hand cut the hexagons- next time I will make a template..... CAS for me- how about that! 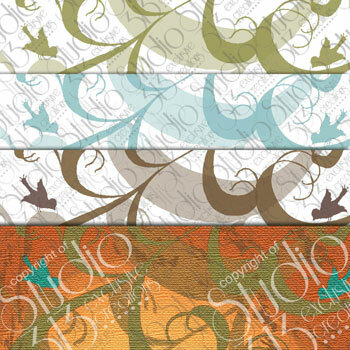 If you love digi's- stop by Create with TLC and don't forget to FOLLOW her blog! She is very talented and VERY generous with her time and talent! Hybrid Chick- Stitching- Card #1 (this blog inspired the hexagons.... on card #3).